What's Your Loudonville Home Worth? What's Your Luther Forest Home Worth? Join Miranda Real Estate Group, Inc.
to see how it works. Message and data rates may apply. Please see our Terms and Conditions of service before using the service or text HELP to 555000. You can opt-out of the Service at any time by texting STOP to the short code 555000. Please note consent is not a condition of purchase. 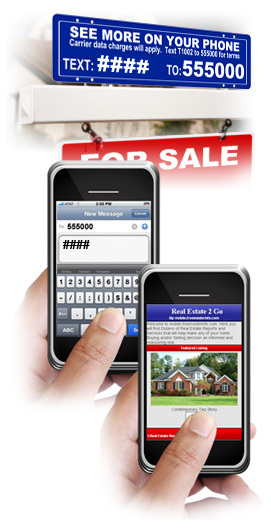 Buyers can now receive immediate information on their smart phone, 24 hours a day 7 days a week (talk to no agent). Getting information on homes is often a lot of hassle. Either you have to chase down the agent, or spend hours online searching for the property. And when you phone for information on homes, you either get the run around or - just as bad - an unwanted sales pitch! Well... it doesn't have to be so hard. You see, many of our homes are already online and can be accessed immediately by punching in a simple text message. You can drive by one of our homes for sale and see the property details and photos right then and there. This is great for everyone involved. First of all, our experience shows that when homebuyers don't have to dodge an agent, many more of them will call in for information on homes. If you're selling, that's really good for you because your home receives exposure to many more prospective buyers. And it's really easy and convenient for buyers too. You can send a text message anytime, day or night, and never have to speak directly with an agent (unless of course you want to). You can imagine how much time this saves you by allowing you to rule out homes you're not interested in viewing. For more information on this unique program, please fill out the form on this page. Willie Miranda of Miranda Real Estate Group, Inc.